The Bible is a collection of sixty-six books that all tell one seamless story. Yet, so often, we get caught in the details and miss the overarching meaning behind its message. In this installment, Pastor Ed Young gives us an overview of the Old Testament and shows us how it not only meant something thousands of years ago, it also means something to us today! 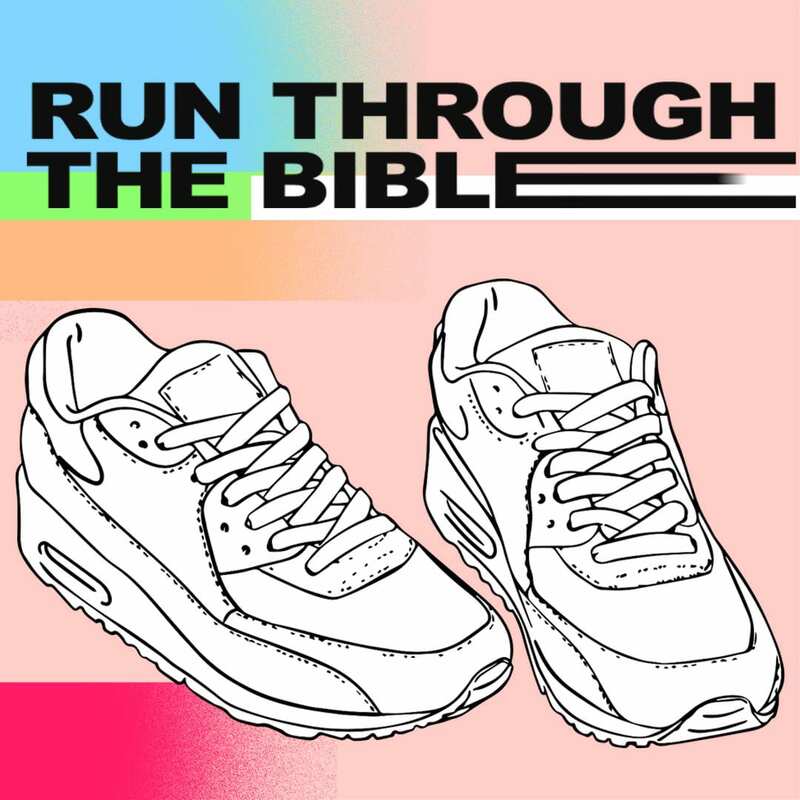 Well, I’m very excited about this series, Run Through the Bible. Not walk through the Bible, Run Through the Bible. If this is your first time at Fellowship, welcome. I think today you’re gonna see and understand the brilliance of God’s word, the Bible. Today we begin with the Old Testament, next week, the New Testament. If you’re like me, and I hate to confess this, I grew up as a pastor’s kid, as most of you know. I had the opportunity to be involved in great churches, had some cool Bible study teachers, Sunday School teachers. Then I went off to a Bible college. I majored in Christianity and Communication. I attended the largest evangelical seminary in the world for four years. I received my Master of Divinity. I took several doctrinal classes and I left during the middle of that to help start Fellowship. So, I’ve had some really great theological teaching. Brilliant men and women have taught me God’s word, and I’m thankful for that. However, no one in my ADD mind ever really helped me (I hate to confess this, but we are in church), helped me see the flow and the story and the context of Scripture. In other words, I never really felt like very many people zoomed out and told me, “OK, Ed. Here is the backdrop of what you’re talking about.” Because I took a story over here… wow. That’s a cool story about Adam and Eve. Took a story over there, Jonah, getting swallowed by a fish! Are you kidding me? Or maybe a Scripture verse in the book of Judges, “Everyone did what was right in their own eyes,” the Bible says, and they all messed up. So, I would take bits and pieces and stories, maybe like you, and I found myself missing the flow, the context of stuff. And I think as you look at our culture today I think you would say in all fields of thought that we’re sort of like that. Whether it be in economics, whether it be in government, whether it be in history, so often we just look at one little aspect and miss the flow. And then I talked to someone who attended medical school. OK, surely someone sat you down in one of the classes and went through kind of the zoomed-out approach. No one. So, it’s interesting when it comes to church that we’ve fallen into the same trap. And I understand. I get it. The Bible is a complex book in many different ways, but also the Bible is a story about His story. And it’s my prayer that His story will become your story and my story. As I go through this today I think you’ll see yourself as I talk about some of these things. Now you might be going, OK, running through the Bible. I don’t see any Scripture verses. I didn’t put Scripture verses on these icons for a reason. Because the Bible, the Old Testament, specifically is not written chronologically. I mean it is, there are some chronological aspects to it but it’s more story. And I thought these icons, because we remember with pictures, could help us get the full context of what we’re talking about. So, make sure that you have one of these. It’s a footprint. Did you get that? A big footprint. 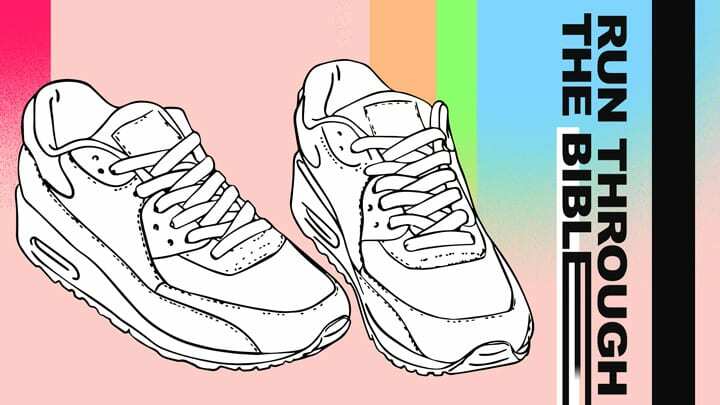 So, this is gonna be your message map because whenever you run, you have to use your toes, and someone told me the other day when they were talking about getting ready to run, 10 toes down. You’ve gotta have 10 toes down. So, I’ve put 10 icons from the Old Testament, the old covenant, that you need to understand. You’ll see some blanks in there, and I’ve purposely left some of the blanks blank, so you can fill them in. Because every time we see a blank - I don't know if you’re like me - but I want to fill it in. So, I’ve given you kind of the rules of what we’re gonna do. It’s gonna be a fun seminar. I think this is something that you can utilize and keep with you for the rest of your life and I’m very, very, very excited about running through the Bible. Well, let’s talk about the Old Testament. Thirty-nine books, written by 28 authors, over 2,000 years. Two thousand years, this story. Then you have the New Testament, which was written over a generation. So, in the New Testament it took them about a generation to write that. The Old Testament, 2,000 years. The Old Testament, one of my professors told me, is the New Testament concealed, and the New Testament is the Old Testament revealed. It’s very important to understand the Old Testament. You might be going, why? Well, when Jesus referred to the Scriptures he was talking about the Old Testament. When the apostle Paul was talking about the Scriptures he was talking about the Old Testament. All of the doctrines in the New Testament have their foundation in the Old Testament. What’s so funny is I read a recent survey that in most evangelical churches nine out of 10 messages are from the New Testament. And I get it, that’s great. But, we’re leaving out these 39 books. That’s why so often if you look back at the menu of all of the messages that we’ve done at Fellowship for 28 years there is a pretty balanced menu regarding the text of the New Testament and the text of the Old Testament. In the second part of this two-part series, Pastor Ed Young gives us an overview of the 27 books of the New Testament. And as he moves us from the Old Testament into the New Testament, we discover how the overall storyline of Scripture continues to point to Jesus and reveals the power and ability he has to help us get the most out of life. Good morning! Are you ready to run through the Bible? I am, too. I’ve enjoyed this series. I need this series as much as anyone. If you’re brand new here to Fellowship I’ve been in a series, which means - you know - we do kind of a meal in bite-sized chunks. I decided to go through the entire Bible in two Sundays. So often we sort of pick and choose when it comes to the Bible. It’s like you go through some sort of a cafeteria. OK, I’ll take this. No, I don’t want that. I’ll have this, I’ll have that. And then you never really take a step back and look at the entire menu! Look at the entire restaurant. Look where the restaurant is, and let me see the context of where I am. ILLUS: This past Tuesday I found myself on a 15-story observation deck with a couple of school administrators looking at a beautiful, massive university. They were pointing out different landmarks. This is the medical school building. OK, that’s a dorm, that’s a dorm, that’s a dorm. And there’s the arena. This university had flown in our creative worship team and also had flown in me and some others to do some speaking before their student body. So, we spoke on Wednesday morning to 11,000 students, then Wednesday night to about 4,000. And it was amazing because Fellowship Church, of course, we have the opportunity now and then to do a lot of traveling, and to spread our DNA to tell others what God is doing. So, it was a great, great trip. What was interesting about the trip, though, was when I walked around the campus on the ground level I got lost several times. It was like a maze, you know? But when I was able to look at everything from the perspective of this observation deck, even though I’m directionally challenged I got it. I was like, wow! I see it now! I’ve got it now. There’s the football stadium, there’s this building, there’s that building. So, context is everything. Perspective is everything. And today we’re zooming out, we’re doing the Google Earth thing, you might say. We’re droning the Bible as we discuss what the Old Testament and specifically the New Testament is all about. Hopefully you’ve brought in your message map. Did you see these footprints? Yeah, we’re running through the Bible. We’re not skipping, we’re not jumping. These are very, very important because as I go through this stuff really, really fast you’ll see on these gorgeous LED screens behind me where you can fill in the blanks. And we fill in the blanks for you as I go through, so just pay attention as we do this because hopefully you’re going to go, “Wow! I was able to climb 15 stories at Fellowship Church and see the Bible in a different perspective. As opposed to going to the cafeteria and going, yeah, I’ll have some beans. No, I don't want any tortillas, but I’ll have some chicken, please.” Yeah, you can do that but let’s look at the whole context of it, the context, the content, and the concepts. This text says the Bible is <breath!> God-breathed. That word is theopneustos. God breathed it. It’s inspired, from Genesis to Revelation. Not revelations, Revelation. The writers from a kaleidoscopic range of backgrounds, of socioeconomic levels, of races inspired by the Holy Spirit of God wrote the Bible. The Bible is a story. Basically, it’s a Him book, a book about Him, Jesus. There’s one hero, Jesus, one villain, the devil, and one message, our Savior rescues. That’s the Bible. That’s the story. That’s the flow. The Old Testament, 39 books, 28 authors, over 2,000 years. Let’s put the light on the Old Testament over there, the light. Why do you have 10 icons? 10 toes, 10 toes down, why do you have 10 icons for the New Testament? 10 toes down. Are you feeling me? OK, I thought you were. The New Testament, 27 books, 9 authors, over 100 years. That’s it. So, it took a couple of thousand years in the Old Testament and only really one generation for the New Testament. If you missed last time, make sure to watch it online. There’s this thing called, as my father says, the in-ter-net. The internet. It’s kind of funny. He’s 82 years old. Gotta show him some love. And you can go online and watch the whole thing and you’ll understand the context, but I do want to bring you up to speed. These message handouts are a great tool for your church to follow along and take notes so they can keep their footing as you Run Through the Bible! You can also use them as a reference point when you're having your quiet time or doing your daily devotional! Download the individual icons and Run Through The Bible. Includes zip file with PNG's and AI File. 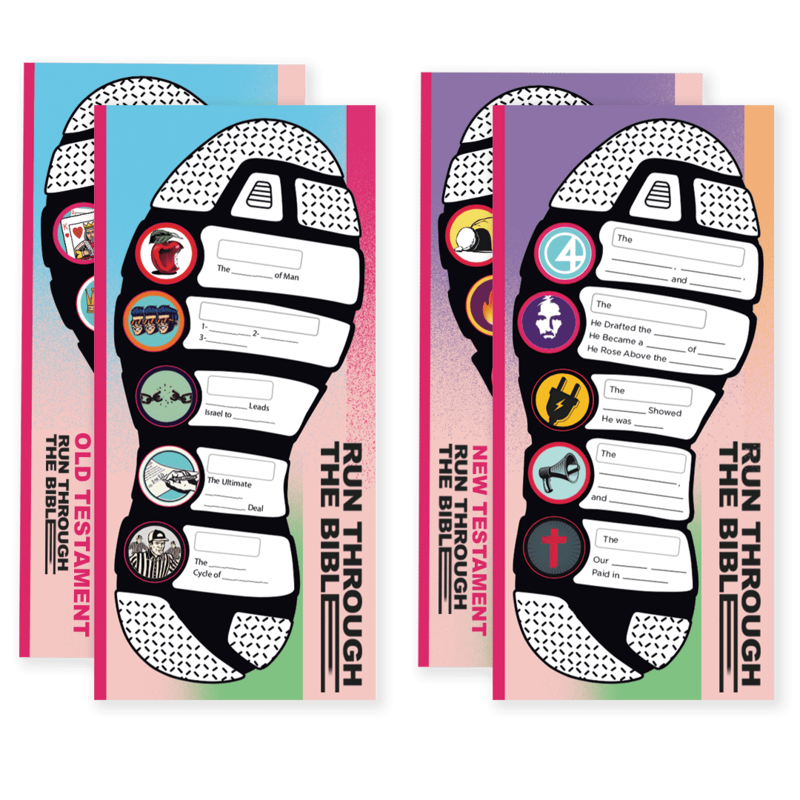 This message opener was created to promote Ed Young's series “Run Through the Bible”. 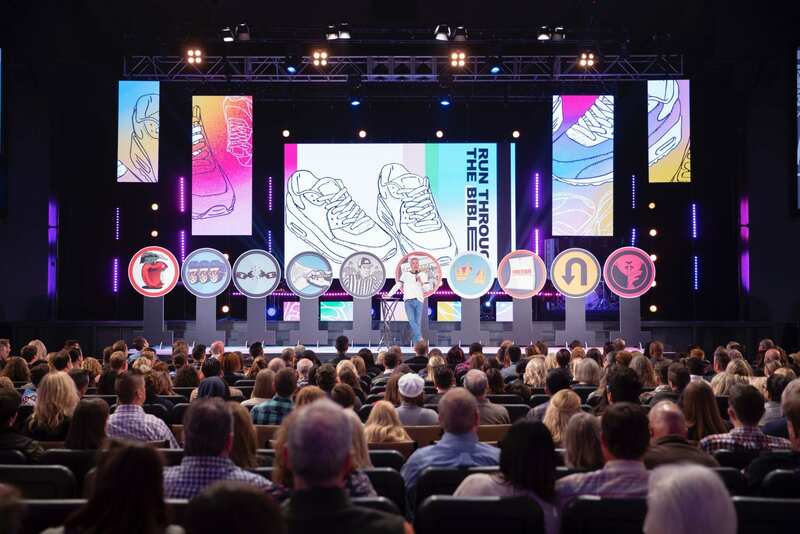 This logo loop will keep “Run Through the Bible” logo on the screen and can help kick off a service or use at anytime to display the title of this series. This countdown clock is used to communicate the planned start time of the service for the series “Run Through the Bible” to the audience. Set the tone for your message with this high resolution graphic from the “Run Through the Bible” series. It is the best-selling book of all time. Its proponents claim it has changed their lives, and its critics condemn it as merely a collection of fables. But what is the Bible really all about? Does this book actually matter in today’s shifting culture? Or is it just an ancient text that’s no longer relevant? As we peruse its pages and consider its claims, we will discover how the Bible – God’s Word – actually has a unified message that runs from the first page to the last page and every word of it has the power and potential to completely transform our lives!